Officer Megan Luz is given a second chance in the form of a new partner: a big, furry police dog named Sergeant Brigit. 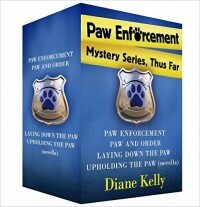 When a bomb goes off in the mall’s food court it’s up to Megan and her canine partner to collar the killer. When a raging tornado turns Forth Worth upside-down, Megan and Brigit go after the trail of a violent street gang terrorizing the local businesses. But when one of the members is a suspect in an unsolved murder case, will Megan see justice served…or end up in the doghouse? The chase is on for Megan and Brigit when three unknown men set out on a city-wide crime spree—can this K-9 team track down the bad guys before the trail runs cold?